A cloud of gunpowder coming out of an etching from the battle of Waterloo 200 years ago explodes through time in the re-enactment of the battle in 2015. 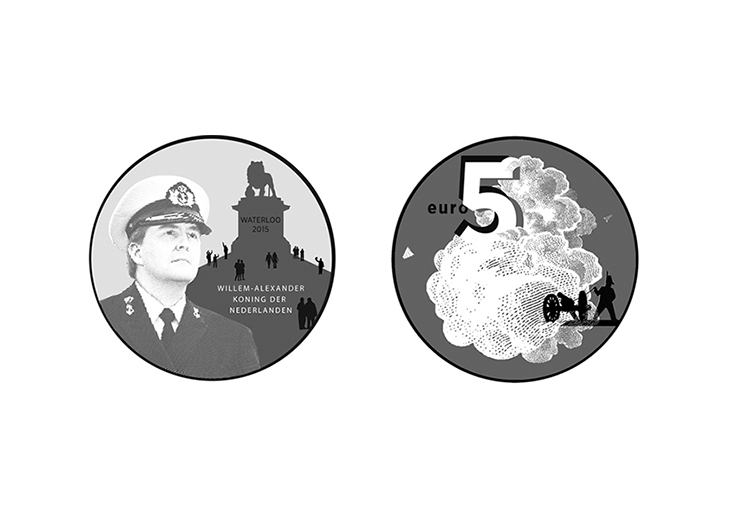 The heads side of the coin features Dutch King Willem-Alexander in uniform, as an audience member of this spectacle. The viewers are standing on the Lion’s Mound at Waterloo as on a tribune, while the re-enactment of the battle unfolds in front of them. The backside shows a cloud of gunpowder, which refers to both the actual historic event as well as its re-enactment. The cloud of smoke is taken from etching ‘Injury of The Prince of Oranje at the Battle of Waterloo’ from 1815, and it comes out of a cannon shot by what seems to be a historic soldier. The 5 euro is quivering from the explosion while mandatory mintmarks fly through the air like shrapnel.